Since the 1950s, Milan has been dreaming of the modern towers to perform important city functions in a kind of a city business district. It would allow relieving the maddening congestion of the city center as is the case in other big cities. Back in those days, the idea was not fully implemented and there were very few towers built at that period. But in the beginning of the new millennium, a big change happened with new skyscrapers rising in Porta Nuova district which became the biggest case of urban transformation in the history of the city. In this route, we're going to walk among both old iconic buildings and the new ones. Starting right at the Central station when you get out to Duca d'Aosta square you cannot but notice one of the most iconic towers of Milan - the so-called "Pirellone" designed by Gio Ponti, Giuseppe Valtolina, Luigi Nervi and other great architects and engineers of their time. It was built between 1956 and 1961 as the headquarters for Pirelli company on the spot of the previous buildings destroyed by the bombarding of the World War II. It was the structure of reinforced concrete instead of steel and was very impressive at its time in engineering terms. After Pirelli, the building housed the offices of Region of Lombardy till the construction of Lombardia Palace which we'll see later. It was one of the first buildings in the city to rise above the height set as a limit in Milan following the tradition that no building should be above Madonnina on top of the Duomo which is supposed to guard the city. For this reason, a copy of Madonnina was actually put on the roof, so she could still stay above all the roofs in Milan. However, it didn't save the tower from some misfortunes. In 2002, it was heavily damaged by a small touristic plane crashing into it. Since then the 27th floor accommodates the memorial for the victims. Standing in the square Duca d'Aosta, you can already see the other towers behind Pirellone - Galfa Tower and Lombardia Palace. One of the most impressive views of Pirelli tower is from the side where you realize its amazing proportions make it seem so thin and elegant. Walking towards Lombardia Palace on the left you see another tower built once for the services of city municipality, with its added "bridge" which works also as another new gate to the city. But the bridge analogy is especially interesting as this street (Melchiorre Gioia) once used to be filled with water of Martesana channel arriving up to Brera almost in the center of the city. Lombardia Palace is welcoming visitors with its curvy shapes. Its courtyard is noteworthy for being the largest covered public space in Europe, but unfortunately, it still fails to attract lots of activity and is not that popular among the locals as, for example, piazza Gae Aulenti under the UniCredit Tower. Certainly, it's not just the covered courtyard that is interesting here. Lombardia Palace is one of the tallest towers in Milan which also holds the highest observation deck available to the public on its 31st floor. Access to it is from the "Nucleo 1" open every Sunday with free access. And here are some views from the tower. The Italians still love their roofs red, no matter what the height of the building is, you got it terracotta-red most of the time. Pirelli and Galfa Towers as seen before. Municipal Services Tower as one of the old buildings together with Diamond and Solari Towers as the relatively recent newcomers. UniCredit Tower is something cosmic with the mirrored surfaces reflecting the buildings at its foot. The famous "Vertical Garden" Towers and older Garibaldi Towers behind them. You can also see the monumental cemetery on the right. The bird's eye panorama of Milan allows you to see the newest towers being built now on the right here - the new "City Life" - a future three-tower complex is still awaiting the third edifice to scrape the sky. The landscape works are still not finished around the district with the "trees library" arriving soon. Back on the ground and leaving Lombardy Palace. 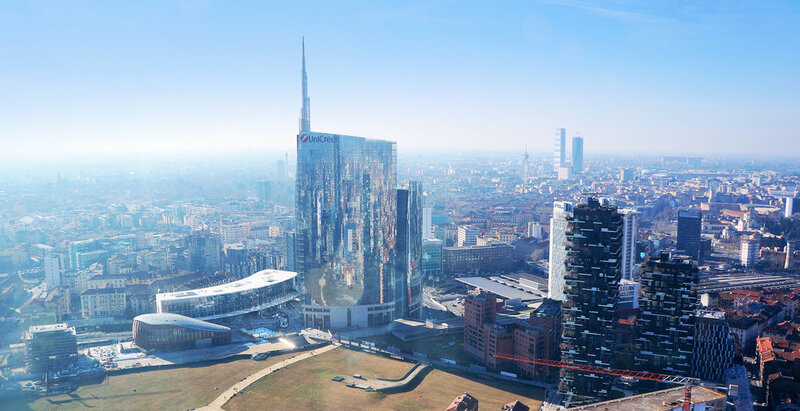 Moving towards the Porta Nuova first thing you notice will be the 53-meter Solaria Tower - the highest residential building in Italy. On the way you get a close look at the mentioned before Municipality Technical Services Tower. It's a building of 90 meters also constructed in the "first wave" of skyscrapers erection in 1966 to hold exactly the technical offices of the city municipality, which nowadays is emptied for the reconstruction. Diamond Tower is 140 meters tall and is the highest steel structure in Italy. Legend has it, its shape with inclined walls is supposed to optimize the amount of sunlight entering it. One of the small buildings next to it (the so-called "diamantini" - small diamonds) is now occupied by Samsung headquarters. Going straight through the residential and business buildings one passes the bridge leading to the Garibaldi part of the complex. Here comes piazza Gae Aulenti with its outstanding UniCredit Tower, designed by Cesar Pelli, the author of the famous Petronas Towers in Kuala Lumpur. Thanks to its 85-meter-long spire it's the tallest building in Italy right now, even if the highest usable floor is located in the Lombardy Palace visited before. Piazza Gae Aulenti is a new super lively center of the city. All the Porta Nuova district was designed to be pedestrian, so the square is raised 6 meters above the surrounding streets to permit the cars to pass below it in a specially designed tunnel. However it creates a small inconvenience making the space very windy, take it in consideration if you wanna spend some longer time in its outdoor cafes. UniCredit pavilion is another part of the complex contrasting all the glass and steel with its wooden ribs. It was designed by the Italian architect Michele de Lucchi and now is open for various cultural events and activities. Don't miss one of the interactive attractions in the square - due to the system of pipes you can hear other floors and people interacting with you from them. Proceeding this way you can reach Corso Como and get to the center of the city in about 20-30 minutes of a leisurely walk. Going in the opposite direction, you can descend to the level of Garibaldi station. Here you can see two other towers which are a part of the railroad station complex. They were built in 1984 and 1992 and have changed their facades quite a lot in 2008-2010. It's claimed that they're the only European office towers that follow Japanese model of the access to the office floors by the elevator directly from the underground station. Also here you can finally realize where all the Porta Nuova district comes from. All the area was a former railroad territory as the tracks used not to stop at Garibaldi, but to pass all way through the North-East of the city passing also old Porta Nuova station. Later this track was demolished while a huge area was left abandoned for many years till redevelopment. That's one of the reasons for the name of the neighborhood behind these towers - "Isola" meaning 'Island' used to be quite isolated from the rest of the city as the railroad followed by the abandoned area was limiting the access to the neighborhood from other parts. Play of reflections create a very special atmosphere in the piazza Gae Aulenti. Following to the Isola part of the district, you can visit now the newly opened park, from the center of which you can see all the main iconic skyscrapers of the new business district. Also, a good view at Bosco Verticale is opening from here. It is is characterized by the system of balconies holding the trees which are supposed to improve the microclimate of the building. A large-scale project of this kind is announced to be a possible solution to the extreme air pollution in Chinese regions. If you ever get a problem with a bike in Milan, don't hesitate to visit La Stecca - the space for local community and associations including the bike repairing workshop. Some nice places to eat can be found in this part of the neighbourhood and especially deeper in the Isola area. It is not only the skyscrapers that are new in the area, here we've arrived at the Casa della Memoria - a center holding the archive of associations preserving the memory of the civic movements for liberty and democracy. If you have some spare time during the workday, come inside and appreciate its special interior. Behind the Bosco Verticale you can notice the so-called Ziggurat which now accommodates the Google Italy headquarters. Amazing detail about Bosco Verticale is that with its top price per square meter in Milan its private bicycle racks are always full. From here you can proceed back to Piazza Gae Aulenti towards the center of the city. Or go farther to discover the Isola district in depth.